Kipchoge Crushes Marathon World Record In Berlin! With two hours of total marathon mastery, Eliud Kipchoge smashed the world record in Berlin on Sunday with 2:01:39, a new world mark by 1 minute 18 seconds. Without question, Kipchoge sealed his place as the greatest marathoner of all time. “I have the fastest marathon. But it is not the fastest marathon,” he said before the race, referring to his unratified 2:00:25 at the Nike Breaking2 project last year. He gave himself an extra place in history today by breaking the world record by the biggest margin in more than 50 years, when Derek Clayton broke it by 2 minutes and 24 seconds in 1967. The 6 minutes, 8 seconds that Kipchoge ran from 40K mark to the finish is also the fastest known in any major marathon, astounding for a man who seemed simply to keep going without any obvious sprint. Running solo after his last pacer stopped soon after halfway (his split was 1:01:06), Kipchoge’s impeccable pacing and the focus of a zen master gave him the official world record that has eluded him in a series of seven major victories, including the Olympics. Kipchoge with his three pacers early in the race. “It was always my ambition to smash the world record, and I felt very confident,” he said after the race. “My run at Monza (the Breaking2 trial) showed me there are no limits. It went as planned. The lesson of running is to train well, and then have full faith in your training and show the proof in the race,” Kipchoge said, always the thoughtful philosopher. He is also always humble and appreciative. Famous for his understated manner on the road and in person, Kipchoge revealed a rare jubilation after he crossed the line, instantly clapping and even brandishing one arm in triumph. It wasn’t so much the win he celebrated, but more his final victory over the distance. WORLD RECORD! Congratulations @kipchogeeliud #Repost @nnrunningteam • • • • • 2:01:39 World Record! His first comment about plans for the future was a joke. “I have run 2:03, 2:00, and today 2:01, so I must next run 2:02,” he said. “In Kenya, we say, never chase two rabbits. My rabbit has been the world record at Berlin. But definitely I’ll be coming back to Berlin, and absolutely I will try to defend my Olympic title.” In Tokyo in 2020, he will be 35. Now Kipchoge is, as he said in Berlin on Friday, “complete,” with the world fastest time (his 2:00:25 in Monza last year was ineligible for the world record because of various time-trial tactics), the Olympic title in 2016, and today’s world record. Wilson Kipsang, who held the world record from 2013 to 2014, and today placed third, paid tribute to the undoubted king. To say no one noticed second and third, Amos Kipruto 2:06:23 and Kipsang 2:06:48, may seem impolite, but the day belonged to the 33-year-old Kenyan, with the only challenge being Gladys Cherono’s fast and tactical run to retain her Berlin title, obtain the course record, and lift herself to be fourth fastest woman in marathon history. The large Japanese squad, bidding for inclusion in the country’s highly competitive Olympic trials, were rewarded with a strong performance in fourth place by Shogo Nakamura, with a two-minute improvement of 2:08:16, and two other men in the top 10. 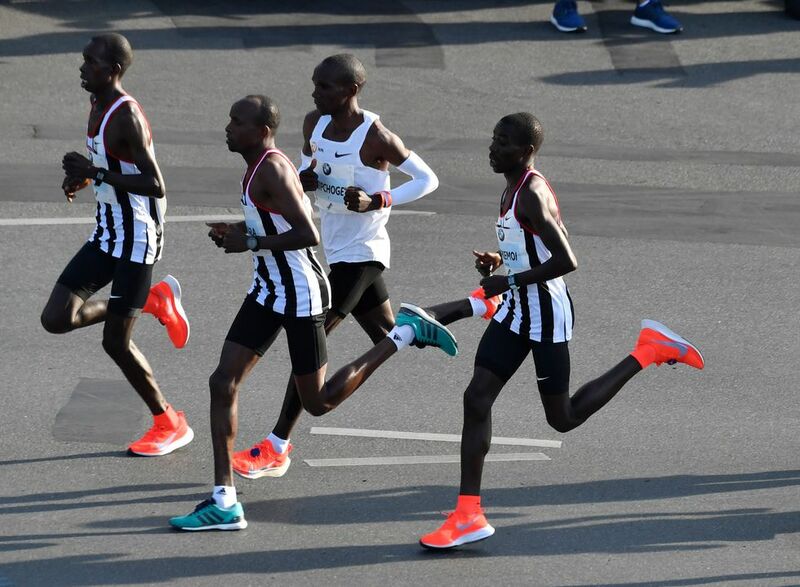 The fast Berlin course produced its eleventh world record (eighth for men), and continued its tradition of breakthrough men’s times, having hosted the first marathons sub-2:05, 2:04, 2:03 and now sub-2:02. Kipchoge rewards two hours of close study. He is a sturdy runner rather than a springy or floating one—not poetry in motion like Haile Gebrselassie, say, but supremely efficient and controlled. It’s the total focus that impresses most. And he is a technical master. Every footstrike (his heels seem not to touch), every split, every curve and corner, was executed to perfection. Watch only his face and shoulders, and you’d take him for a thoughtful man out walking the dog. He moved through the whooping waving crowds calmly. Once, when he tossed a drink bottle, he was so controlled that he could aim where to throw it. I have watched great runners for 70 years, from Emil Zatopek to Gebrselassie, and not since Abebe Bikila in 1964 have I witnessed a world marathon record set with such focused mastery.